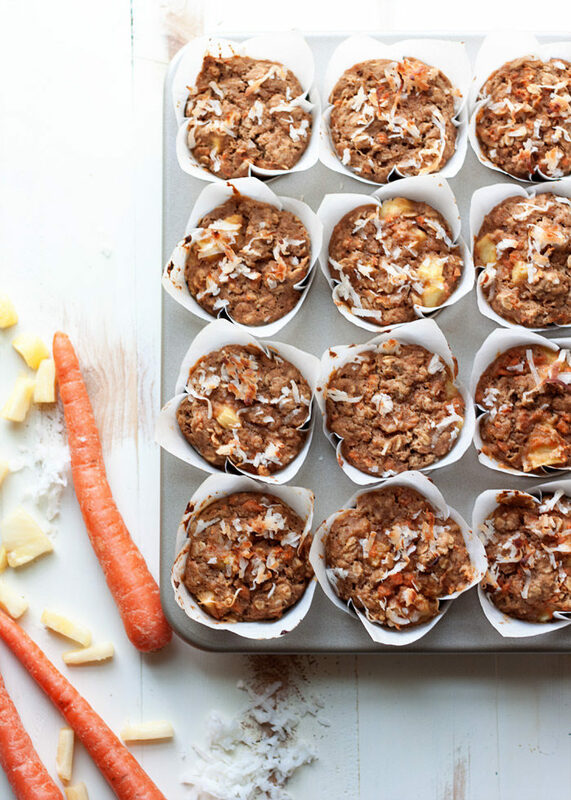 With sunny bits of carrot, coconut, and pineapple, these super-moist, super happy muffins are another reason to smile on even the dreariest of days. The list of ingredients is a little long, I know – but these muffins are worth it. I promise. 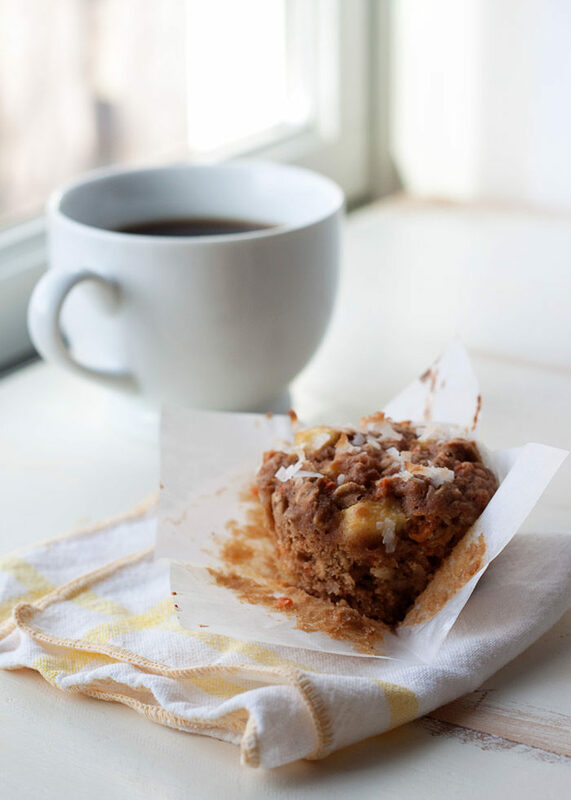 I originally shared this recipe back in 2013, and it’s consistently one of my most popular muffin recipes. I recently rephotographed the recipe and also reworked it a bit – now the recipe has a dairy-free option. 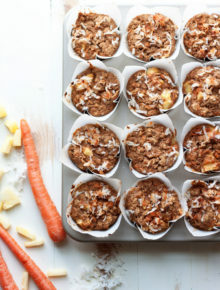 We’ll be making these again Easter weekend – what could be more perfect for Easter breakfast than carrot muffins?! With sunny bits of carrot, coconut, and pineapple, these moist carrot muffins with coconut and pineapple are another reason to smile on even the dreariest of days. It used to just be my golden retriever and me. Her name was Angelyne, and every night I’d lure her onto the bed with a treat. Then I’d roll to my side and she’d curl into the crook of my knees. Many people prefer to keep the dog off the bed, but Angel was the perfect 90-pound heater – a must in wintertime. By dawn, she’d have shifted upward, her head on the pillow next to me. I’d smile through my sleepy fog. “Good morning, sunshine,” I’d say. She’d slurpily lick me on the face. It was gross. But happy. 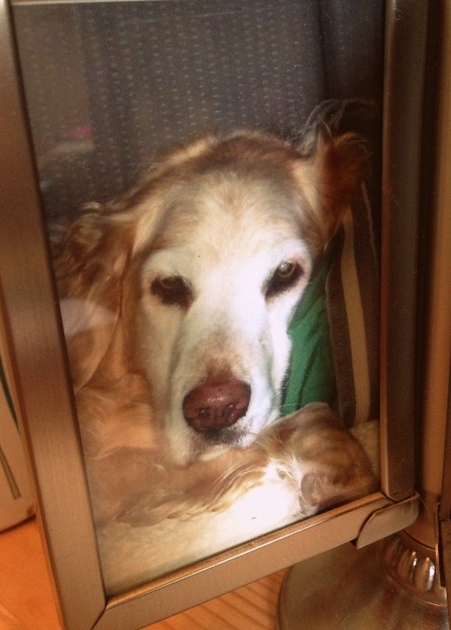 She was a good dog. I miss her. But now I’ve got another little ray of sunshine, my audacious young toddler who, like Angel, also happens to sport sweet golden curls. Lately, she wakes up in her crib in the middle of the night and – with (ahem) parental assistance – makes her way to our bed. And so every morning, the three of us all wake up together. She lays between us, usually stirring long before we’re ready to wake. Soon she chirps. “Hi!” “Da da!” “Ma!” “Nose. Eyes. Mouf. Eyebwows,” she pokes our faces and, despite ourselves and our desperate wishes for more sleep, we smile. And then we laugh. Our little sunshine. And so it is in honor of those little rays of sunshine in our lives that I named these muffins. With sunny bits of carrot, coconut, and pineapple, these super-moist, super-happy muffins are another reason to smile on even the dreariest of days. 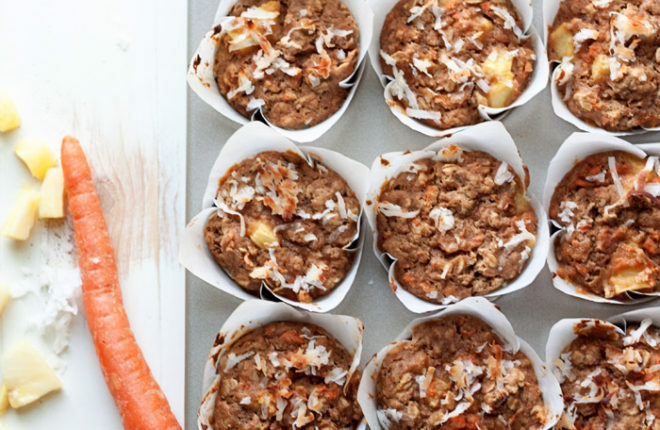 They’re a riff on my hearty spiced carrot muffins, a favorite of adults and picky toddlers alike – with some added coconut. Inspired by the hunk of pineapple left over from shish kabobs and mojito sangria, I threw that in too. Just generally inspired, I shifted the spices around a bit. My toddling little sunbeam helped by placing liners in the muffin tins, “mixing” together the ingredients, enthusiastically gobbling the (literal) fruits of our labor, and, of course, making me smile all along the way. Preheat oven to 375 degrees Fahrenheit. Grease or place cupcake wrappers in a standard-size, 12-cup muffin pan. In a large bowl, whisk together the flours, oats, baking powder, baking soda, salt, cinnamon, and ginger. In a medium bowl, whisk together the milk, applesauce, brown sugar, vegetable oil, egg, and vanilla extract. Pour the wet ingredients over the dry and whisk just until all ingredients are incorporated. 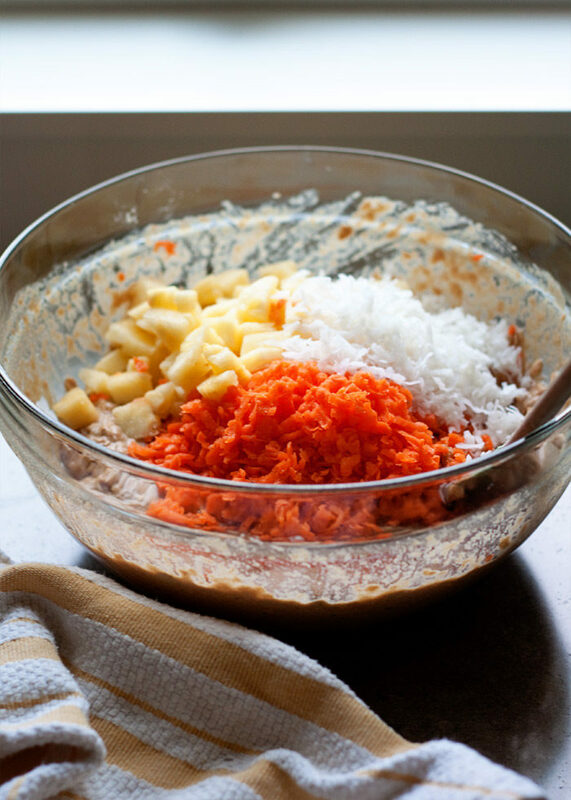 Gently stir in the carrots, 1/2 cup coconut, and pineapple. Use a cookie scoop to divide the mixture between the muffin cups. Cups should be filled to the top. Sprinkle tops evenly with remaining 2 tablespoons coconut. Bake for 20 – 25 minutes or until muffin tops spring back when poked and a toothpick inserted into the center comes out clean. 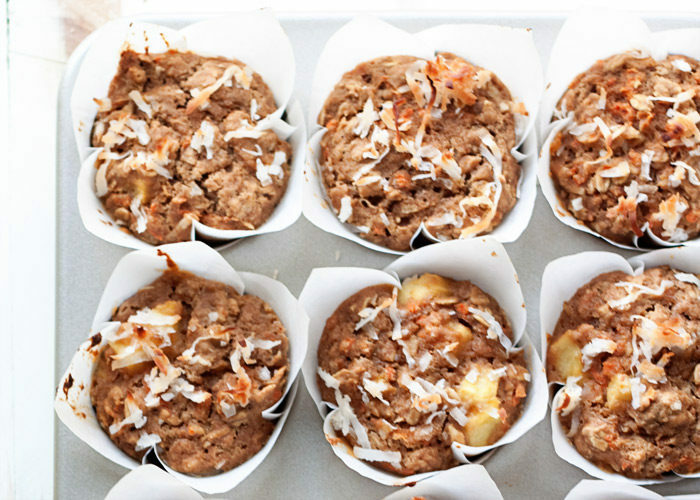 Allow to cool for 5 – 10 minutes before removing from the muffin tin. Serve plain or with butter, if desired. Originally published Jun 3, 2013. Updated April 3, 2017. Mmm, I haven’t had breakfast yet, and now these are all I want! They look so filling and hearty yet so delicious and fluffy! Definitely making these soon. Pinned! Beautiful photos and a beautiful post too! One of my cats lays on top of my feet every night, which is also quite convenient during wintertime. 🙂 And now we’re going to have to make these again, with pineapple! Thanks so much. YES – I love when my pup lays on my feet in the winter. Quite handy! I really need to give these a try. They sound like they’ll be one of my favorite muffins! G’day! What a great way to start the day, true! Just finished making these and they are amazing! Thanks for the recipe! I liked the option of using 1/2 the sugar. Didn’t have ginger so I used Pumpkin Spice. Yum! Pumpkin spice sounds like a great alternative! 🙂 So glad you like them. LOVE them. This made a huge recipe (12 muffins plus a small casserole/loaf pan.) Sunday-morning substitutions: didn’t have applesauce, so made a sauce from frozen peach slices and lemon curd. No milk, so used 1/2 half-and-half and 1/2 soymilk. Hi Lynda, wow, the frozen peach and lemon curd sounds fabulous – what a creative substitution! And now I am dreaming about lemony peach muffins. 🙂 Thanks for sharing! I used coconut oil instead of veggie oil and added a cup of chopped walnuts. Incredibly delicious muffins. Thanks! So glad to know these work great with coconut oil! I’ve been using it more and more in recipes – such a great thing, coconut oil. EXCELLENT RECIPES! I made the GOOD MORNING SUNSHINE muffins and everyone LOVED them. I forgot the sugar so I quickly added a cinnamon brown sugar crumble on top. The muffins were great even without sugar and just a crumble on top..Great for those wanting to eliminate more sugar from diet. I am making more today and can’ t wait to make the other tasty named muffins. The black bean burgers also a hit. LOve this site. Creative named recipes and easy to follow. Thanks much and will continue to follow. PS I am vegetarian and my hubby is a meat eater too. Hi Jeanie! Thank you so much for your kind comment. 🙂 Glad to know I’m not the only one who forgets sugar in muffins – I swear I do this once per month! Good save! I made these yesterday, they are very good! I would add a little more ginger. I used 2 eggs, coconut oil, didn’t have applesauce so I used grated apples. Also added 2/3 cup chopped walnuts. I think canned pineapple is a little bland next time, fresh. Hey – I was at that entomophagy bake-off and just found this recipe when going to try my hand at making cricket muffins! The love goes on…. No modifications needed or desires. Yum yum yum! I wanted to see if the batter could be made a day in advance and still be OK? don’t want to lose the leavening and I know sometimes that’s a problem. I have the wet and the dry all assembled, thinking I could store them both and then quickly assemble in the AM for a time saver. Would love your thoughts. Hi Jill, you probably already know the answer by now as you left this comment awhile ago, but that might work if you keep them separate. I definitely wouldn’t recommend combining wet + dry and then storing! Let us know how they turned out if you get the chance. Made these last night at hubby’s request. I managed to make 18 regular sized muffins. Hubby has had 3 and I have had 1. The kids are refusing to try them. I liked the fact you gave options for the amount of sugar that could be added. I added the recipe to a calorie calculator and these wonderful things are only 123 calories. Used 3/4 c. of ww flour and 1/4 c. flax seed. Baked these at a high altitude(7800 ft) and they turned out great!!! Wow! Delicious! I made them this morning. Moist and healthy!!! New family classic! Thank you!